during qualifying for the Monster Energy NASCAR Cup Series O’Reilly Auto Parts 500 at Texas Motor Speedway on March 29, 2019 in Fort Worth, Texas. 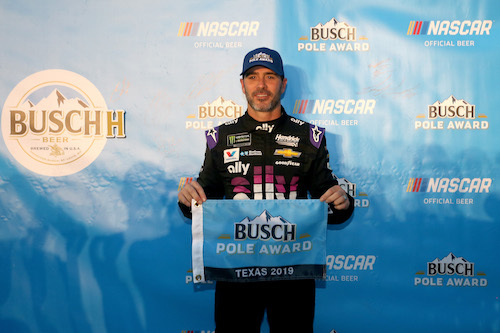 Jimmie Johnson claimed his 36th-career Monster Energy NASCAR Cup Series pole but his first since July 2016 on Friday when he posted a 28.588-second/188.890 mph lap in the third of three rounds of qualifying at Texas Motor Speedway for Sunday’s O’Reilly Auto Parts 500. Hendrick Motorsports swept the top-three positions on the starting grid, with William Byron joining his teammate on the front row and Chase Elliott qualifying third. The other Hendrick Motorsports driver, Alex Bowman, crashed in the opening round, and therefore, will start the race from the back in a backup car. Friday evening’s qualifying session was the first under new rules implemented by NASCAR that calls for all cars to make a timed qualifying lap in each round to which it advances or have all previous round times scrapped and start the race in the back. The only car failing to do so was the No. 88 of Bowman in the second round. But his team was busy unloading its backup car to start in the back, anyway. 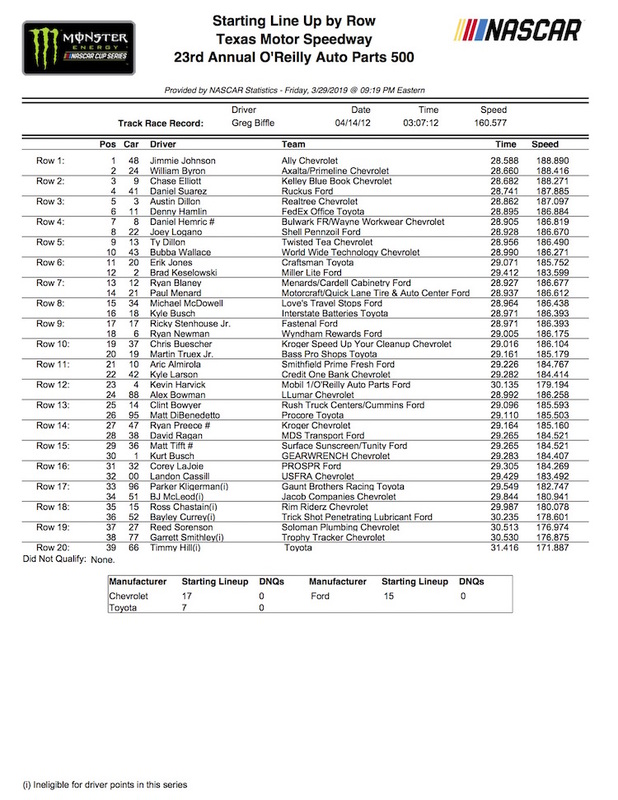 NASCAR did issue a pit road speeding penalty to Timmy Hill during the first round of qualifying, but his lap of record was the slowest of the 39 drivers entered, also putting him in the back, anyway. Controversy came, though, when Ryan Newman seemingly blocked Clint Bowyer on pit road when Bowyer tried to go onto the track for a qualifying lap in the opening round. A pit-road block, under NASCAR’s new qualifying rules, calls for the blocker to start the corresponding race in the back. Newman, though, was not penalized, much to the dismay of Bowyer. Newman advanced to the second round in which he claimed the 18th spot on the starting grid, while Bowyer was unable to advance beyond round one, winding up with the 25th starting spot. Johnson led throughout the day. After posting the fastest lap time in Friday’s lone practice session, he was fastest in all three rounds of qualifying. His third-round, pole-winning lap was his fastest overall, of the qualifying session. He posted laps of 28.628 seconds/188.627 mph and 28.730 seconds/187.957 mph in the first and second rounds, respectively. Daniel Suarez was the highest-qualifying Ford driver and non-Hendrick Motorsports competitor, qualifying fourth. He was fourth in both the second and third rounds of the session, despite making runs by himself early in each of the rounds before the big drafts hit the track. Austin Dillon qualified fourth, and Denny Hamlin was the highest-qualifying Toyota in fifth.